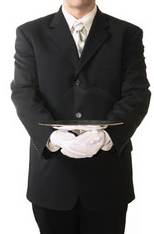 You Don’t Have to be The Ritz Carlton to Provide Unforgettable Service ~ HELLO, my name is Blog! When my publishing/consulting company was just starting out, I worked nights & weekends at The Ritz Carlton to make ends meet. My job was s a valet crasher parker. AND HERE'S WHAT I LEARNED You don't have to be The Ritz Carlton to provide unforgettable service. 1. Decide how you want customers to describe their experience with you. Have each employee write down his top three words. Tally them up. Vote on the three most popular. Then print them on posters, wallet cards and inner-office materials. This will keep the service philosophy in front of people’s faces, thus holding them accountable TO and giving them ownership IN to a decision they contributed to. What’s your service philosophy? 2. I’m sure we can find a way. This sentence will put upset customers at ease. It’s solution oriented, positive and flexible. And even if you don’t know off the top of your head what the heck you’re going to do, say it anyway. You’ll think of something. Will you find a way? 3. In a commoditized world, the key differentiator is service. That’s why you’re reading this article. Because you KNOW that it ain’t the products, it ain’t the website, it ain’t the warranty and it ain’t the commercials. It’s YOU. Your service. Your people. Your culture. That’s what customers are buying. And the more unique it is, the more of it they will buy. Otherwise they have about a zillion other choices in the click of a mouse. How are you branding your service? 4. Increase customer pride. Create an exclusive club, special level or elite status. Enable people to become card-carrying members of SOMETHING. Then, your customers will take pride in the fact that they’re your customers. Hopefully by showing that card to their friends. My friends @ Brains On Fire did this in a cool way. They designed a special website for people who weren’t exactly customers, but whom they loved anyway. These people were called “Kindred Spirits.” And BOF even handed out little business cards (selectively) that thanked certain people for being special. Totally awesome. How are you making your customers prouder? 5. Friendliness isn’t enough. You need to be (specifically) friendly. See, the word is defined as “Favorably disposed; inclined to approve, help, or support.” So, your frontline needs to be idea friendly. Question friendly. Emotion friendly. Complaint friendly. User friendly. Employee friendly. Get the picture? How friendly are you? 6. Reveal your authentic self in your service. As you’ve already discovered, customers don’t like robots. They like people who are uniquely imperfect, just like them. They like people who aren’t afraid to exert their distinctiveness, even in mundane moments like answering the phone or replying to a tech support email. How are you integrating your humanity into your profession? 7. What are they going do wrong next? This is the standard issue posture of 80% of the customers who walk into your hotel. Or restaurant. Or club. Or wherever you work. This exists because people are SO used to getting crappy service from dishonest, unreliable businesses, they now expect it from everybody. As such, you’re starting with a negative balance with ALL of your customers. Fortunately, this preoccupation is the PEFECT opportunity for you to prove them wrong by delivering unforgettable service. Are you going to be unexpected or just like everyone else? 8. What else can I help you learn? Try asking this question in place of, “Is there anything else?” or “How else may I be of assistance?” It’s unexpected, thought provoking and revolves around your ability to educate your customers. Try it. I triple dog dare you. Are you teaching? 9. Your company. Your company = YOU! Your company = The words you use. Your company = The words you OWN. Your company = What Google says about it. Your company = The person who answers the phone. Your company = The stories you tell. Your company = The stories customers tell about you. What’s YOUR company? REMEMBER: Anyone can provide unforgettable service. Even if you're not The Ritz. For the list called, "12 Ways to Out SERVICE Your Competitors,” send an email to me, and you win the list for free!